Mobile app development companies are facing major challenges in customer retention. The main challenge for the marketing team is how to get more users on-board, and most importantly keep them engaged. However, marketing experts believe that it is more important to gain the loyalty of the long-term customer than keep on searching for the new and casual ones. Also, there is always an apprehension that the existing customers may chuck your mobile app, which means saying goodbye on the grounds that they did not find your app useful and worthy. So, a marketer’s core job is to keep the interest of existing customers, awake. For this purpose marketing, people can adopt some marketing skills that can certainly implement using the Push Notifications for direct communication or interaction with customers via push notifications. Push notifications are two times better in comparison to broadcast messages. Push Notifications also improve the lead conversations as well. Marketers have to plan a strategy on what type of message you would send to the users and how it will benefit them. So here some tips to keep existing customers for long-term. When planning to start sending push notifications, the best thing would be to segment your target audiences. Because you cannot put all your audience into a single category, each one has a different requirement. The messages sent out to the targeted customers are based on their taste and preferences that is called consumer behavior. The user data and search history that you gather through the app will play an important role here. One of the effective strategies to avoid losing the users is sending personalized notifications through push notifications, which means giving your users what they are searching for. This strategy will give a positive result if you have completed the segmentation of the customers properly. Now, you can easily decide which messages are appropriate for a particular group of customers, which helps to drive more traffic to the app. If you are personalizing the content, you are making it more relevant to the user. Nowadays, rich notification is more popular than static, so that in addition to the personalized push notifications, you can also plan to send the rich notification. This is a more interactive messaging tool which includes images, audio, and video messages apart from the text. Focus on quality rather than quantity. It is a universal statement true in many sections. Concerned to the relevance of push notification, you have to follow it depending on a purpose of your app which it is dealing with or what service or product does it offer. There is a chance of users getting unhappy because of sending push notifications at random intervals. Rather, you need to have a check on the frequency. It is important that whenever you are sending, the notification at whatever time interval, it should make an effect and not just go unnoticed due to bad timing. Bringing back lost customers onboard is quite possible with push notifications. According to a research, it has been found that most of the users return to the mobile app within a span of one month if the push notification is enabled. To re-engage your lost customers, you can send them attractive offers and discounts. This is one of the effective ways employed in the mobile app marketing strategy as app development companies are more aware of the power of tailored and personalized notifications. Considering the response of the users you can enhance how successful has an app been? Based on the metrics, you can find which strategy helps to succeed and bring an improvement in push notification, thus, gaining the loyalty of the customers even more. Also, it is important to take the data about: location, browsing of a specific category within the app etc. 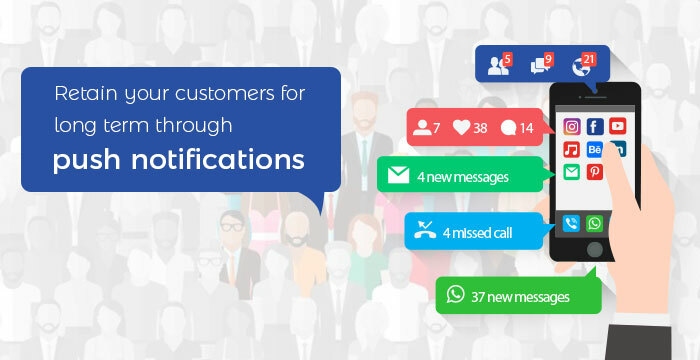 All these factors will boost the user retention and you can send the personalized messages based on the data to improve push notifications services. Push notifications help in bringing back the lost customers and re-engage them. And it is always as one of the most powerful strategies to gain the attention of more users and keep the existing ones interested. However, this static is helpful when sending the notifications is relevant and useful.